Patient and friendly driving instructors and we welcome students of all abilities including nervous drivers. Learn to drive in a comfortable VW Polo which is fitted with dual controls, has air conditioning, leather steering wheel, ABS, ESP, traction control, driver, front passenger and front side and head airbags. 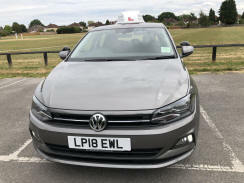 We are a driving school based in Epsom, Surrey teaching in a VW Polo, we cover Epsom, Ewell, Sutton, Worcester Park, Chessington, Cheam, Tolworth, Ashtead, Banstead, and Tadworth and surrounding areas. Lessons can be co-ordinated to collect and drop from home, work or school within these areas. You get a full hour driving lesson. With a high first time pass rate we get you on the road safely and confidently. Once you have thrown away those L plates we can offer Pass Plus course and Motorway driving.